FORT LAUDERDALE, Fla. (AP) — Police charged Donald Trump's campaign manager with simple battery Tuesday as a videotaped altercation with a reporter transformed what was another messy campaign sideshow into a criminal court summons. Trump decried the charges. Jupiter, Florida, police determined that probable cause existed to charge Corey Lewandowski, who has served as Trump's most trusted political adviser for much of the past year. Police on Tuesday morning issued Lewandowski a notice to appear before a judge on May 4 for the misdemeanor charge, which carries up to a year in jail. Speaking to reporters on his airplane in Wisconsin Tuesday, Trump said Lewandowski has been "very seriously maligned," vowing to stand by him. "I can't just stand by and watch a man's life be destroyed," Trump said. "I'm sticking up for a person because I'm not going to let a person's life be destroyed. No jury, in my opinion, would convict a man and destroy a man's life over what you witnessed." This injects a court battle into an already contentious Republican primary season just a week before a high-profile election in Wisconsin. The Trump campaign released a statement declaring Lewandowski "absolutely innocent of this charge." "He will enter a plea of not guilty and looks forward to his day in court," said the statement. "He is completely confident that he will be exonerated." Police charged Lewandowski after reviewing a surveillance video of the incident, obtained from security at the Trump-owned property. Police determined that the video shows Lewandowski grabbing Michelle Fields, who worked for Breitbart News at the time, as she tried to ask Trump a question during a March 8 campaign event. Trump cast doubt on her claims, telling reporters that he doubts her claims that she suffered bruises from Lewandowski. "How do you know those bruises weren't there before? She said she had a bruise on her arm. Take a look at her facial expression, her facial expression doesn't even change," he said. Earlier Tuesday, Trump released a series of tweets reversing a previous position that the incident never happened, hinting instead that he feared for his safety. "Why is this reporter touching me as I leave a news conference? What is in her hand??" Trump tweeted along with a picture that appears to show the young reporter holding a pen. "Why is she allowed to grab me and shout questions? Can I press charges?" he wrote, calling Lewandowski "a very decent man." Fields shot back on Twitter: "My story never changed. Seriously, just stop lying." On March 11, Lewandowski tweeted a message to Fields, saying he had never met her. Fields has tweeted several times about the incident, retweeting others' comments, some including video showing what occurred at the event. Trump took to Twitter to respond. Why aren't people looking at this reporters earliest statement as to what happened, that is before she found out the episode was on tape? The New York businessman's rivals seized on the news, which comes a week before a Wisconsin primary contest that could give Trump an insurmountable delegate lead or give his opponents new hope of a contested national convention. Texas Sen. Ted Cruz said the incident is "the consequence of the culture of the Trump campaign — the abusive culture when you have a campaign that is built on personal insults, on attacks and now physical violence." "That has no place in a political campaign, it has no place in our democracy," Cruz told reporters as he campaigned in Wisconsin, suggesting that "it helps clarify for the voters what the Trump campaign is all about." Cruz asked his senior aide, Rick Tyler, to resign in February for spreading a story that falsely alleged former rival Marco Rubio insulted the Bible. Ohio Gov. John Kasich said he "probably would suspend somebody" depending on the evidence available. "When we see things that we think are inappropriate, we take action and that's what I would do," Kasich said while campaigning in Wisconsin. It's unclear what impact, if any, the news will have on Trump's march toward his party's presidential nomination. Critics cast it as another example of why the brash billionaire would struggle to attract women in a prospective race against Democratic front-runner Hillary Clinton. The incident fueled fresh attacks by anti-Trump groups, who have already been attacking the billionaire for failing to quell violence at his rallies. Our Principles PAC has been airing an ad featuring news clips of violence at Trump rallies and playing audio of the GOP front-runner saying of a protester, "I'd like to punch him in the face." "The police in Jupiter, Florida, have clearly seen what Donald Trump refuses to acknowledge: his campaign manager battered a woman and caused serious bruising," said Our Principles PAC leader Katie Packer. "In any job in America this would be grounds for firing. Instead, Donald Trump has praised him." In the days after the alleged assault, Trump told CNN that the incident was probably "made up." Campaign spokeswoman Hope Hicks went further at the time, charging in a statement that "not a single camera or reporter of more than 100 in attendance captured the alleged incident." "Lewandowski grabbed Fields' left arm with his right hand causing her to turn and step back," reads the police report. Fields showed police her left forearm which "appeared to show a grabbing-type injury," according to the investigating officer. 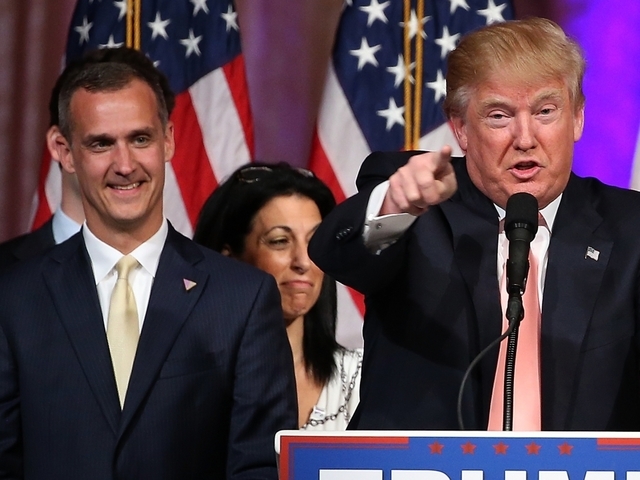 Lewandowski has retained a Florida attorney who said Tuesday there would be no further comment. The charge, a first-degree misdemeanor, carries a potential sentence of up to 1 year in prison or up to a $1,000 fine, according to Florida statutes.